DatapointLabs Technical Center for Materials is participating in a number of conferences in the coming months, both as event sponsors and technical program participants. The technical papers continue to focus on the topic of “Validate Before You Simulate,” evaluating factors that can affect simulation accuracy. Look for us if you'll be attending one of these events, or contact us to set up an appointment to meet with one of our representatives on site. Digimat Users' Meeting 2016, October 4-6, 2016; Lisbon, Portugal. CADFEM ANSYS Simulation Conference, October 5-7, 2016; Nuremberg, Germany. Attend our presentation, "A Mechanism for the Validation of Hyperelastic Materials in ANSYS." Look for us in Booth #26 among the conference sponsors. International CAE Conference, October 17-18, 2016; Parma, Italy. Western Pennsylvania ANSYS Users Group, October 21, 2016; Canonsburg, PA USA. Presentation: "Testing, Modeling and Validation for Plastics Simulation in ANSYS." DatapointLabs founder and CEO, Hubert Lobo, and laboratory director, Brian Croop, have written a book describing the state of the art in material testing for CAE, which is now available from NAFEMS, the International Association for the Engineering Modelling, Analysis and Simulation Community. This book informs simulation users of the manner and methodologies by which materials are tested in order to calibrate material models currently implemented in various FEA programs. It incorporates extensions beyond basic material models to address currently active areas, including explicit simulation. Find a review of this book on Knowmats.com, a curated repository of information related to materials and simulation. Progress on the Validation of Simulation for Ductile Polymers, presented by Hubert Lobo at the Materials Meet Engineering conference sponsored by LyondellBasell, July 2016. The GISSMO damage model available in *MAT_ADD_EROSION of LS-DYNA provides the ability to add material damage and failure to constitutive material models such as MAT_024, which do not contain this capability. The model is a phenomenological formulation that allows for an incremental description of damage accumulation, including softening and failure for a variety of metallic materials. TestPaks for GISSMO are provided as a collaboration between DatapointLabs and Dr. Paul Du Bois and include all the specimen preparations, tests, and post-processing of data. An LS-DYNA GISSMO material file is provided. Order the LS-DYNA GISSMO Failure Model TestPak from our online Test Catalog. Start with the right material data: Begin with accurately measured physical properties of the actual material to be used in your product, taking into account the intended manufacturing process. Fit the data to the correct model: Once the right data is acquired, it must be fitted to a numerical model that translates material behavior into something the simulation software can use. The material model needs to account for the effects to be simulated. Perform a mid-stage validation: Gain a better understanding of the effect of variables such as solver fidelity, choice of material model, material data quality, and parameter conversion on the accuracy of the simulation. Strive for consistent, error-free export of material data to the simulation environment: A simulation-driven product development environment makes it vital that material data must be uniform, controlled and traceable, readily accessible, and consumable by simulation solvers and other external processes that need materials information, ideally supported by an enterprise-wide materials knowledge core. With accurate material properties data, as well as properly evaluated and well fit material models, the objective of achieving an accurate simulation becomes much more feasible. The materials experts at DatapointLabs Technical Center for Materials have been serving material inputs for leading CAE solvers for over two decades. We now offer a range of services and software that facilitate all interactions with materials information across the product life cycle. 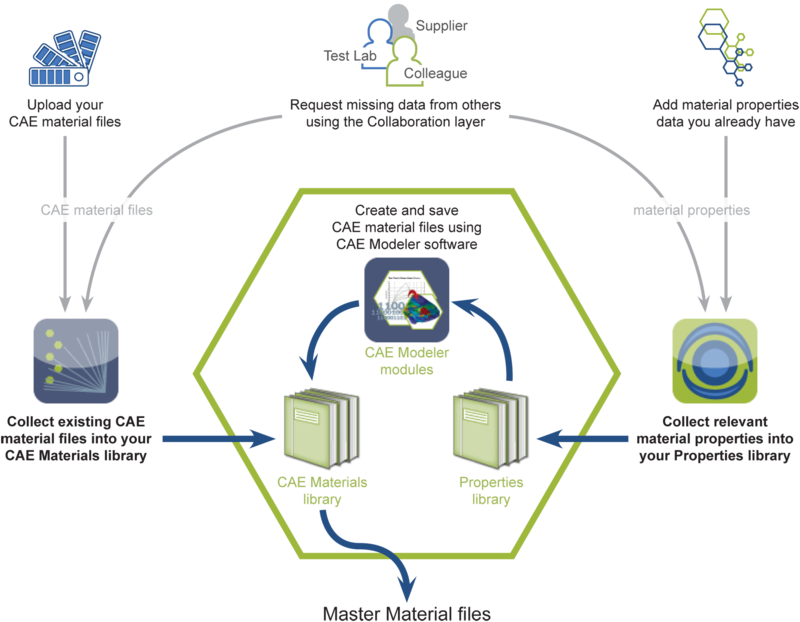 Process workflow for CAE Materials: Collect viable material data into master material files, using consistent terminology across the enterprise, and ensuring that all users access the same master material files. "We continue to devote resources to this important task of incorporating materials into simulation, bringing years of DatapointLabs experience to simplify this complex and often confusing process." Find out more about how the latest release of Matereality® Software for Materials supports an enterprise materials workflow for simulation-driven product development.